Thank you Marty for featuring the eggs this week!! I am so flattered!! Make sure to visit Marty at A Stroll a Thru Life and while you are there check out her gorgeous home decor! I think I might have a problem...or a condition. Maybe it's a syndrome, whatever it is I got it bad!! I can't stop MacKenzie - Child-ing everything! I just want to black and white check anything I can get my hands on!! You know I can hear what you're thinking...yes I am a bit or even totally crazy!! Since I don't have any little tykes around for Easter, I felt it was OK to go with a more mature Easter egg design this year. It was my turn to pick the colors! 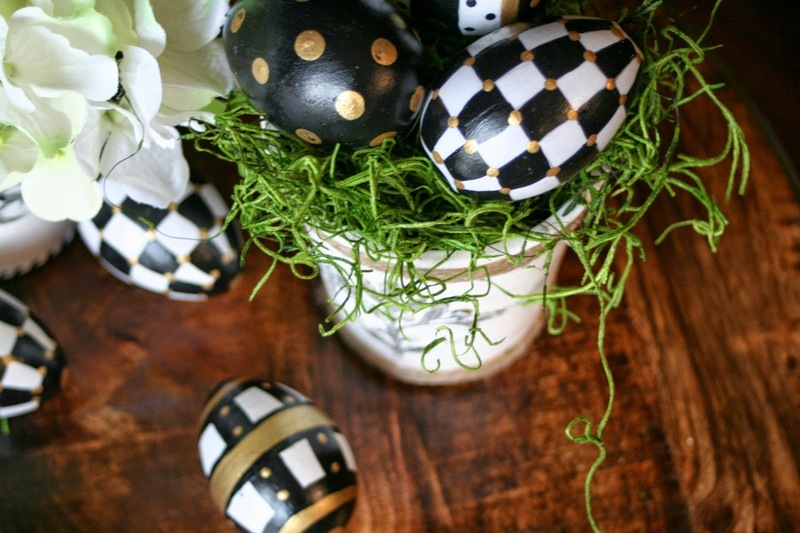 Although I do have to say, my boys would have been perfectly happy to paint their Easter eggs black.....I vaguely remember a camouflage colored egg or two. 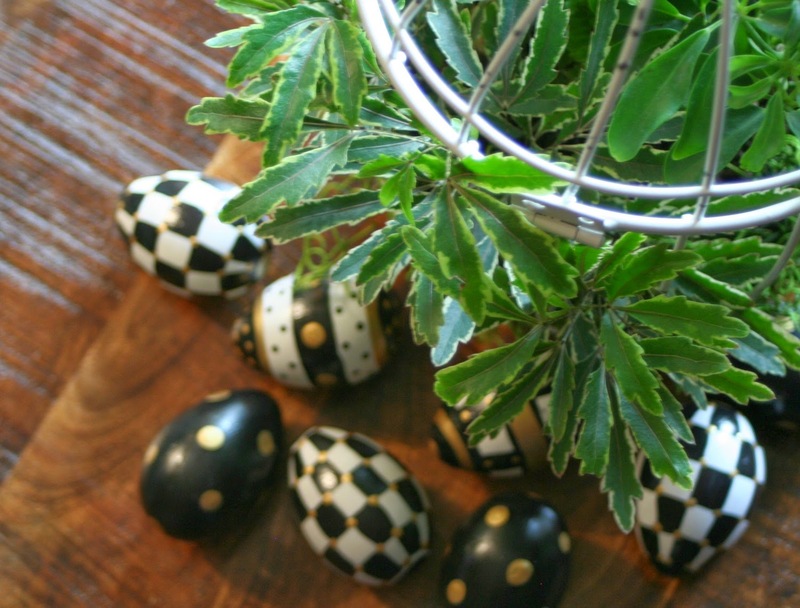 I haven't dug out my Easter decorations, so these little eggs don't have a basket yet. Are you reading my mind???? Do you think there is a MC basket project waiting to be created??? 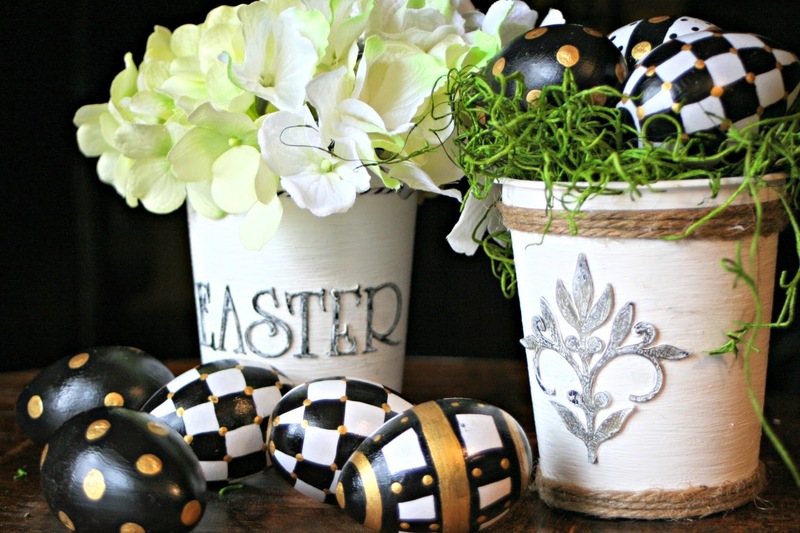 In the photo below you can see that I did have these little sour cream containers, yes I said sour cream containers, already decorated for Easter. I just painted them white. 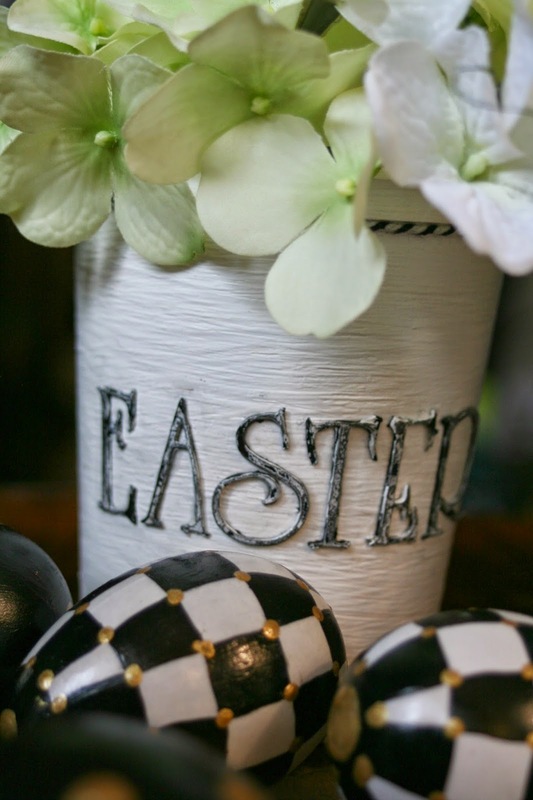 Using black paper I cut out the word Easter and a flourish on the Silhouette Cameo. Glued them to the container. Then I dry brushed some white paint over the letters and the flourish. I finished them off by gluing some twine to the containers. Pretty simple, this would be a fun project for kids too. 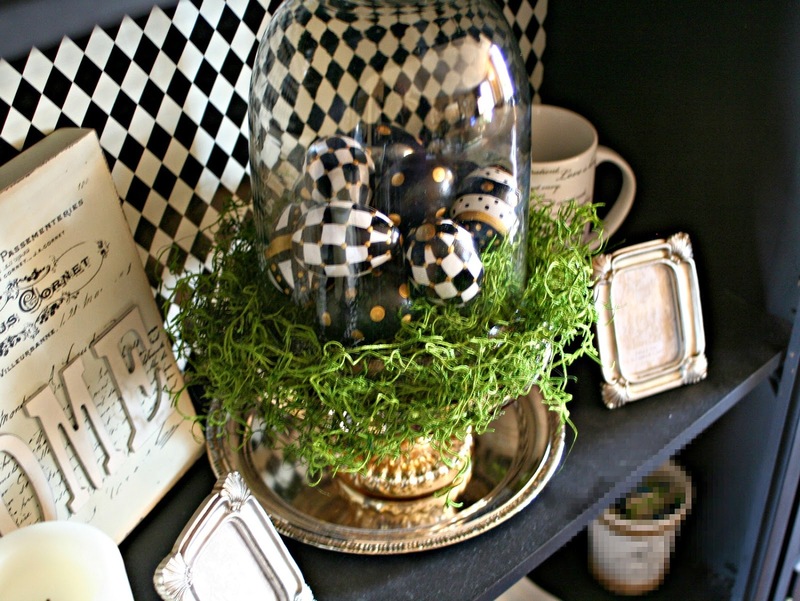 In the photo below is the cloche where the eggs ended up for now....you know I still have a basket idea swirling around in my brain! 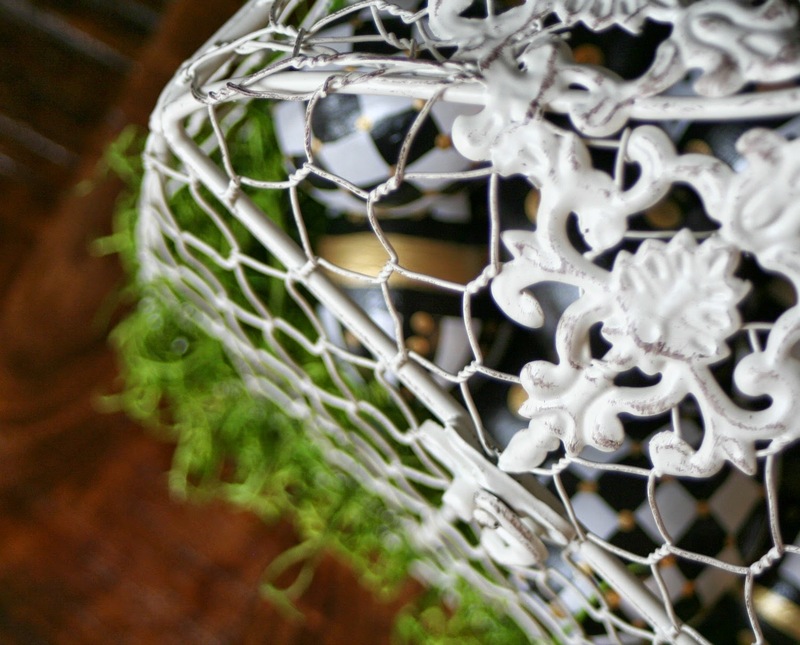 I liked the eggs in the birdcage below too, but after a family vote the cloche won! 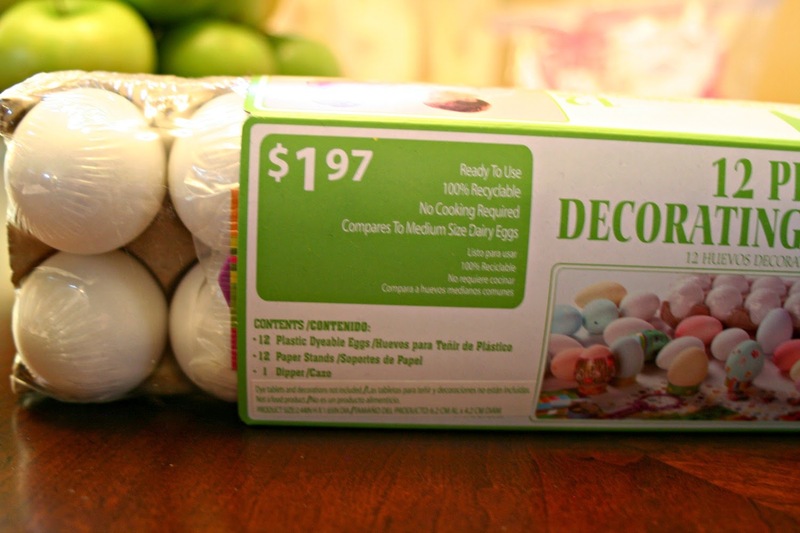 These were the fake eggs I used for this project. They are so cool and unbreakable, I dropped them dozens of times! They have a great matte finish ready for paint or dye. Sign up to follow me with email or on Pinterest or Facebook. Thank you Dana! Still want to get together and make our card holders! Oh Lori, those are awesome! 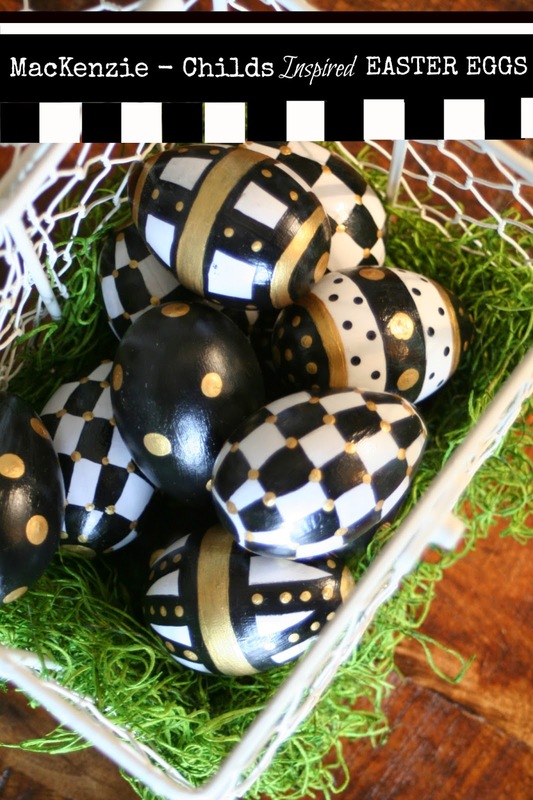 I love Mackenzie Childs! Thank you Marty!!! I am thrilled about the feature THANK YOU!! Love these, Lori! 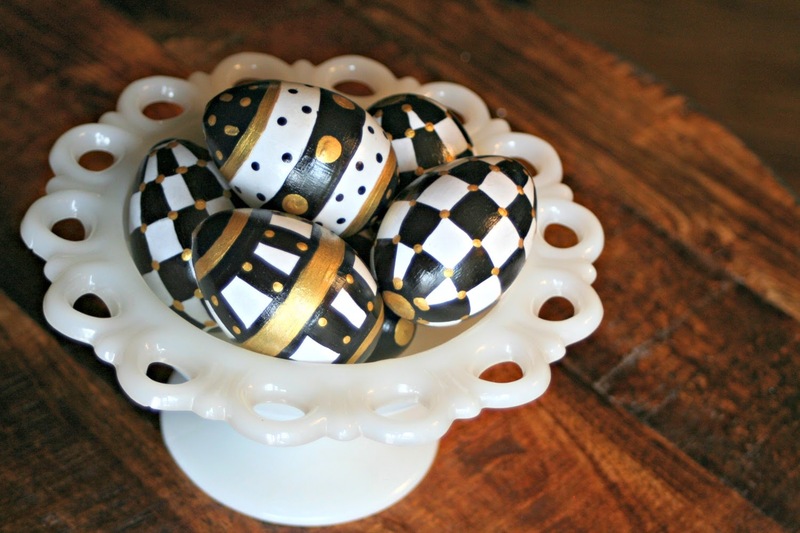 I am a MacKenzie-Childs fan, too, and just love how these turned out. You are very talented. If I tried these they'd be a mess! Thank you Kathy!! You have some pretty fabulous creations on your blog!! Wow! 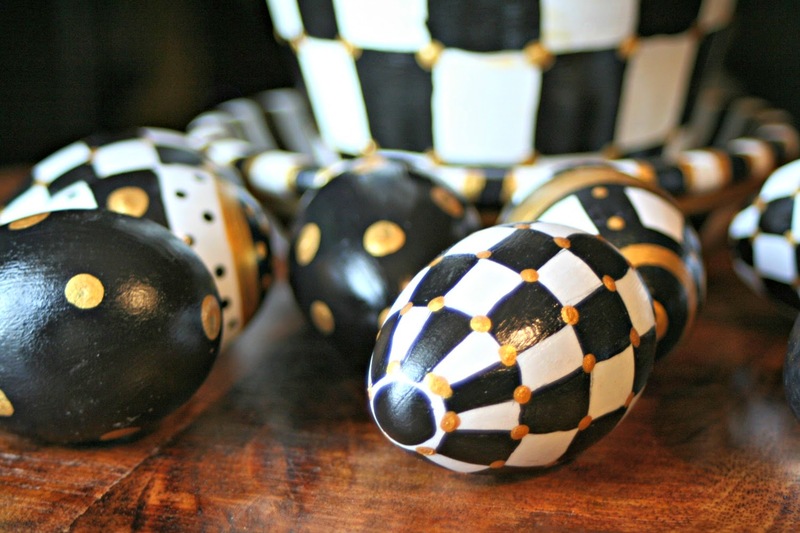 Your Easter eggs are beautiful. Holy Wow! You sure put a lot of time into those eggs! I just finished a b &w checkered stool and boy was that a time consuming job. I still have the 2nd one to to and am dreading it! Enjoy them, they are beautiful! Thank you JP!! They did take awhile to paint! Love these! You are amazing, I can't imagine how you did it! They are gorgeous! These are absolutely gorgeous! You did an amazing job! So dramatic! Wow!! I love all things MC. These look fantastic! Great job! 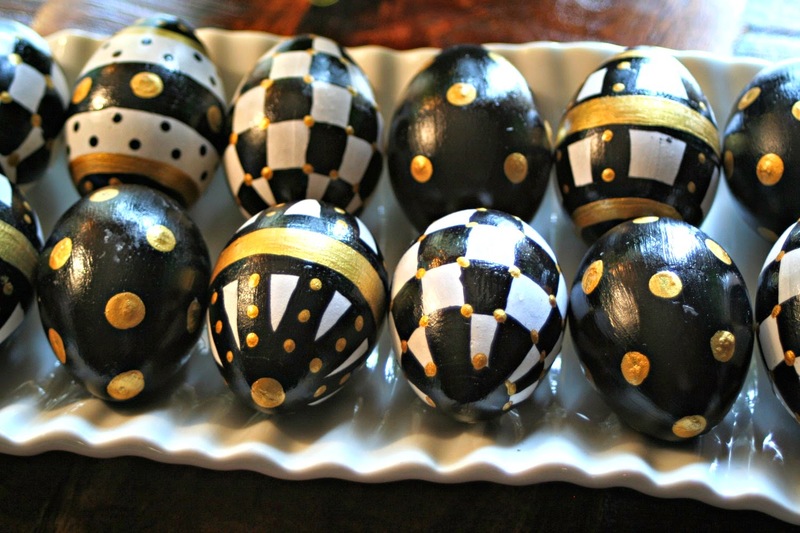 I love these eggs and I commend you for painting them. I take the easy way out and go to the Mackenzie-Childs barn sale each year and buy my Courtly Check items. I am your newest follower! I found you at A Stroll Through Life. 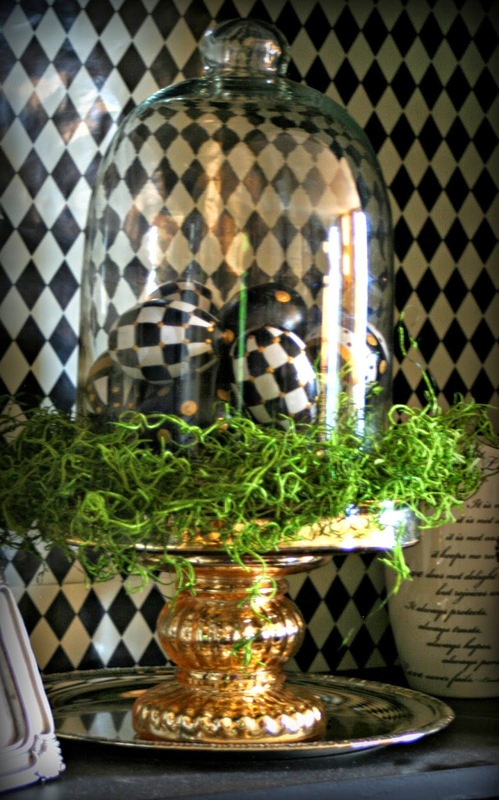 How adorable is this?I too love MacKenzie Childs and have that look throughout my home and on my blog. Good to see ur blog!!!!! 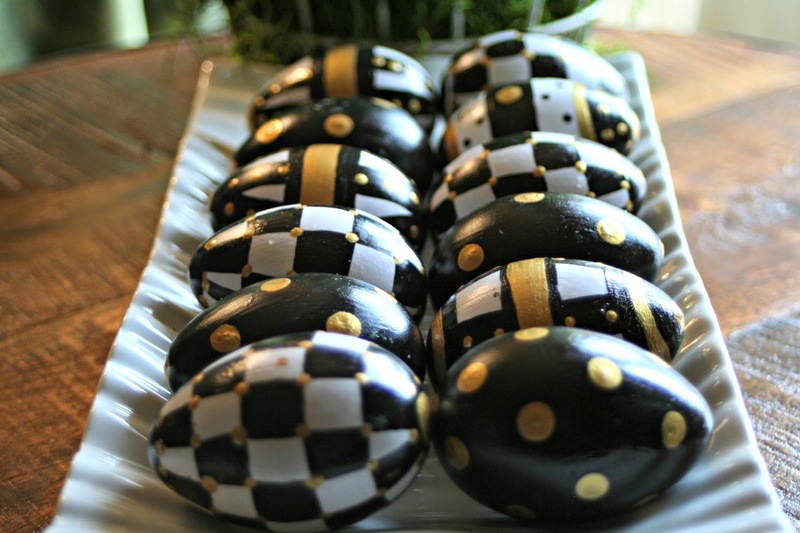 Your M-C style eggs are GORGEOUS! I'd love to try to make some...probably for next Easter. It'll probably take me that long to do them. :) Happy Easter. Visiting from A Stroll Thru Life. love them , want them! Lori, I'm an avid and passionate MacKenzie-Childs collector. I was hooked back in the 1980s. Your eggs are fabulous! I'm not crafty, but these sure do tempt me to go buy some paints. Where did you buy the carton of eggs? Thanks for sharing this idea. I'm following now! I love these!! Can you tell me what you used to paint them? Ok, but where are the instructions? What paint did u use?